Thank you Women Lawyers Association of Michigan, Macomb Region for hosting this wonderful event for Friends of Foster Kids! Please join us in this social evening with appetizers, door prizes, raffle, cocktail ticket and cash bar. Everyone is Welcome!! Tickets are now on sale for WLAM-Macomb’s 3rd Annual Cocktails for a Cause Spring Mixer, May 18, 2016 at 5:30PM at J. Baldwin’s in Clinton Township: 16981 18 Mile Rd, Charter Twp of Clinton, MI 48038. $35/ticket, $65/pair, $300/Party Pack of Ten in advance, or $40/ticket at the door. 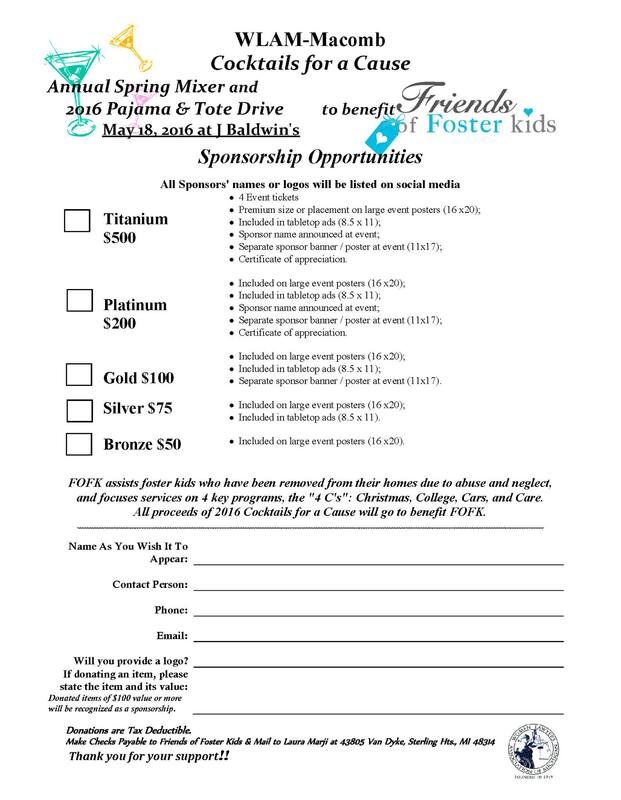 Sponsorships available, download a sponsorship form here and contact a WLAM Board Member for details. All proceeds go to benefit Friends of Foster Kids. 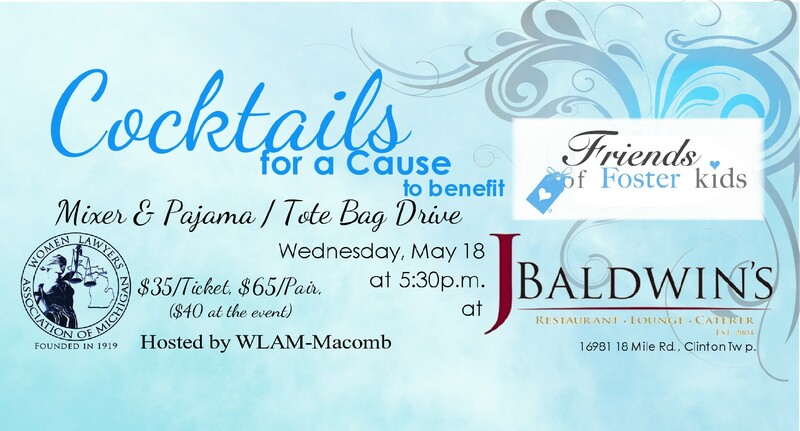 This year, the WLAM-Macomb Cocktails for a Cause beneficiary is Friends of Foster Kids (FOFK), a Macomb County non-profit organization that assists foster children who have been removed from their homes due to abuse and neglect and placed in temporary housing or shelters. FOFK assists foster kids ranging in age infants to young adults who are preparing to age out of foster care. This year’s Spring Mixer includes a Pajama & Tote Bag / Duffel / Backpack Drive for the kids! Many foster kids do not have PJs to sleep in, and often are forced to move from home to home using plastic bags. PLEASE consider bringing a new pair of PJs in a new backpack, duffel bag or tote bag for a child in foster care (sizes infant through 4X). Please join WLAM Macomb at our host J.Baldwin’s in Clinton Township on May 18. Everyone is welcome — you don’t need to be a woman, or a lawyer, to attend this event!